What separates armed robbery from many other theft crimes is the use of force, violence, assault or placing a person in fear, while depriving them of their property. If a firearm is used, 10-20-Life may be applicable. At the law firm of Fernandez and Hernandez, LLC, our robbery defense attorneys represent individuals charged with a crime including armed robbery and burglary throughout the State of Florida. What is the Difference Between Robbery & Burglary? Robbery is a unique crime, apart from burglary or theft, because it involves the presence of a victim during the actual act of stealing and some level of or threat of force. What separates armed robbery from many other theft crimes is the use of force, violence, assault or placing a person in fear, while depriving them of their property. If a firearm is used, 10-20-Life may be applicable. If you and your friend rob someone and your friend is armed, then you could also be charged with armed robbery under the principal theory. Under 10-20-Life, there is no chance of probation and no gain time. It is day-for-day without a chance for parole. Ten years for being armed, 20 years for firing the gun, and 25 to Life if someone is injured. What Could My Possible Sentence Be For Armed Robbery or Burglary? The sentence an individual receives depends on many factors including prior criminal history, what kind of weapon was used, if there is a history of violent offenses, how much the stolen property was worth and whether or not the victim was injured. If an armed robbery is committed by an individual while they have possession of a firearm or a deadly weapon then the minimum prison sentence will be 10 years. If a firearm is discharged there is a mandatory minimum 20-year prison sentence. If someone is injured or killed during the course of armed robbery the prison sentence is a minimum of 25 years and a maximum of a life sentence. Being charged with armed robbery will undoubtedly have a lasting effect on an individual if they are found guilty. 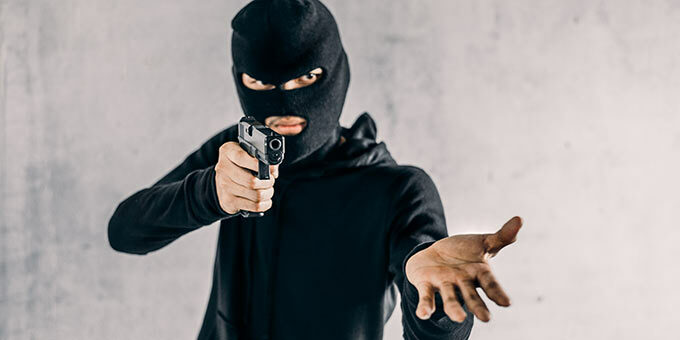 If you have been charged with the very serious crime of armed robbery you are going to need a robbery defense lawyer that will be able to offer various different defense strategies that will help an individual avoid having to face the most severe penalties. At Fernandez & Hernandez, LLC, our robbery criminal defense attorneys protect the rights of clients from the moment the criminal accusation is made to the final resolution of the case. Who Should I Call If I am Charged With Robbery or Burgary? Our burglary and robbery lawyers know how frightening a criminal charge can be, and we understand the emotions and confusion that our clients and their families go through. The Fernandez & Hernandez law office is at your service. We will continue to strive upon improving and bettering the situations of our clients. Life as you know it does not have to be over, but you need the honed skills of a focused and dedicated attorney to improve your situation. If you or someone you care about has been charged with armed robbery, contact us immediately. The law firm of Fernandez & Hernandez has the experience and skills necessary to assist you in your case. We dedicate all of the firm’s resources and energy in getting you the best results possible. Our attorneys continue to strive upon improving and bettering the situations of our clients. Each and every one of our clients receives focused, individualized attention to their criminal case from beginning to end.